Preschool favorites Angelina Ballerina™, Barney™ and Fifi and the Flowertots™ are celebrating the joys of friendship with lots of fun along the way in the Friend Pack 4 DVD Set arriving in stores February 1, 2011 from Lionsgate and HIT Entertainment. This 4-disc collection includes the debut of Chapman Entertainment’s Fifi and the Flowertots full-length DVD “Fifi’s Talent Show.” In addition, the set features the all new CG animated series from Angelina Ballerina and the loveable, huggable Barney. As the new Friend Pack includes so many of the princesses favorite character's I knew that she would be overjoyed to check out this all new DVD collection (Available in stores February 1, 2011)! The all new Angelina Ballerina in CG animation, has become a beloved show for the princess, she adores dancing and loves to dance along with Angelina as she watches the show. In this adorable DVD Angelina learns about several different types of dance, and the princess not only had fun learning, but danced along as usual in pure delight! Although the princess is not very familiar with Fifi and the Flowertots, she was excited to have the opportunity to check out Fifi and her cute flower friends as they put together an adorable talent show! Overall, wonderful compilation of some of our absolute favorite character's! The Friend Pack from HIT Entertainment would make a wonderful Valentine's Day treat for little one's! The Friend Pack from HIT Entertainment will be available at a retailer near you and at online retailers on February 1, 2011! All of your Child's FAVORITES in the Friend Pack! One Lucky Reader will receive the Friend Pack 4 pack of DVD'S! Leave a comment~ Which character in one of the three programs featured in the Friend Pack is your little one's favorite? The comment is considered your entry. 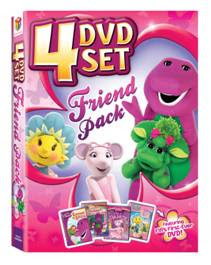 2) Tweet ~ ALL the Favorites in the Barney~Angelina Ballerina~Fifi Flowertot Friend Pack!4 DVD'S! #Win @savvycouponmom http://bit.ly/fVteCG #Giveaway (can be repeated twice daily for additional entries~ copy paste please~cut and paste- the bit link must be posted in the tweet - I will check) (Additional 5 Entries - 5 Comments). Entry to this giveaway ends at 12pm PST February 28, 2011. Winner's are chosen randomly through random.org. The winner will be announced in a post within 7 days of the giveaway ending, and contacted through email. The winner will have 48 hrs. to respond or another winner will be chosen. Angelina Ballerina is my daughter's favorite! My niece and nephew LOVE Barney-he would win the cartoon battle anyday! Barney is my little one's favorite. Angelina Ballerina is our favorite. My son's favorite would be Barney.